The Sterilite Small Nesting Showoffs Containers and an endless amount of uses. 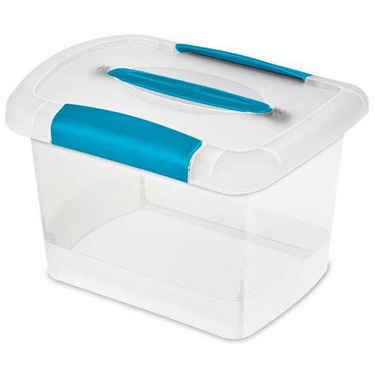 With a white lid and built in blue handle, the small nesting tote (also known as Sterilite 1872) has a clear base so you can find items inside. Like all Sterilite Showoffs, the small nesting showoffs storage container has side latches that lock on the container for a secure fit. This Sterilite showoff is a "nesting" tote can be used in an office or garage to collect and keep small items like craft supplies or tools. Put these Sterilite Showoffs on a shelf with CDs or store kids toys. The Sterilite Small Nesting Showoffs come in a set of 6.